Each year we try to figure out how we want to do Christmas. We don't have a set formula yet, and maybe won't ever, so that we can keep it fresh and exciting. Of course it is nice to have some family customs, and one is giving gifts. I don't think the kids will let us forget about that one! Here are some things we're striving for in giving gives this year. This year we're making quite a few of our gifts. I always appreciate the time and thoughtfulness of a homemade gift. Possible ideas are crafts (the kids love making these! ), homemade treats, photo books, and more. 2. 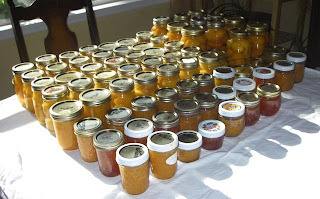 Think "Do" not "Stuff"
We are constantly trying to declutter the house, and by the amount of stuff we see in thrift stores, we know we're not the only ones! Giving a gift of doing something (like going to a museum, a special experience, or a nice dinner out) means no clutter but a wonderful memory. For the person who has everything, a donation in their name to an organization they support can be the best gift. It is amazing how much impact a purchase from an individual or small business has compared to one at a big business. In addition, if you buy local, you are reducing the amount of gas needed (and even though prices have come down, they aren't cheap by any means!). Plus you are saving your time! Craft fairs are common this time of year (Border Inn today, Ely Convention Center on December 7), and a great way to support local individuals, businesses, and groups, and also pick up great Christmas presents. By the way, today is Small Business Saturday! Where are your favorite places to shop for Christmas gifts? Do you have other recommendations for giving? I'd love to hear! Here are some things we've done to get in the proper spirit. Nope, we don't shoot turkeys (although that is very tempting, especially since the non-native ones introduced here a few years ago are wreaking havoc on the ecosystem). We went to our local Turkey Shoot (a fundraiser) and shot at targets; the winners took home turkeys. We let the kids participate, as where we live guns are important tools for getting your food. We want them to respect guns and learn how to use them properly. The turkey shoot turned out to be a very family friendly event, and we enjoyed spending time with each other outdoors. Bonus: we did some good shooting. Well, since we won some turkeys, we had to check one out more thoroughly. The giblets were our area of focus. We looked up information on the neck (tasty for soups), gizzard (special organ at top of stomach to grind up grain since turkeys don't have teeth), liver (largest organ), and heart. Then we dissected the organs. The kids thought it was really cool. Here's pre-dissection. I did take a post-dissection photo, but what's the fun in showing that when you can try doing it for yourself! Looking forward to eating some turkey tomorrow! Have a super holiday and weekend! Back in October, Desert Girl and I took Amtrak from Salt Lake City to Sacramento, a 13-hour journey. Then we spent two nights in Sacramento before returning. Here are some of the things we saw and did during our stay in Sacramento; hopefully they'll get you started on trip planning if you decide to visit this beautiful city! We had passed these whimsical statues the day before when we got off the train, but on Thursday we really had a chance to enjoy them. Desert Girl liked that they were just her height. And where can you find them? We passed the Amtrak Station and headed south to the California State Railroad Museum. We had been fortunate enough to see the Utah State Railroad Museum earlier in the year, and we wanted to see what California had to offer. The museum was impressive, with lots of trains and explanations. We walked through a sleeper car, where the volunteer graciously took our photo. It was interesting seeing the old-fashioned sleeper car and comparing it to the modern Amtrak sleeper we had just been on the day before. Then we headed over to the dining car, with a peek in the kitchen and then the elegant seating area. A volunteer conductor let Desert Girl ring the dinner bell. Despite all the cool exhibits, interactive demonstrations, and amazing information, Desert Girl's favorite spot was the play area, with eight train tables available. As we were leaving, I couldn't resist snapping a photo of the celebration of the meeting of the Transcontinental Railroad. We had visited Golden Spike National Historic Site earlier in the year, and seeing references to it made me remember that fun trip! It was also interesting learning about how the railroad progressed from California to the East Coast, and the idea-men and stakeholders needed to do that. We spent about 2.5 hours in the museum and easily could have spent more time if I had let Desert Girl play longer or if she would have let me read more exhibits! I suspect we'll be back sometime when she's older. Right outside the museum we found Old Sacramento State Historic Park. We wandered over to the river to take a look and then started meandering through the historic district. We ate some lunch and enjoyed people watching. We also checked out the River Walk on the other side of the river. To get there, we crossed the big gold bridge, called the Tower Bridge. It was really neat. If I had dared to run out in the middle of the highway, I would have spotted the Capitol building framed by the bridge. But I used common sense and stayed on the sidewalk with Desert Girl. We wanted to get an even closer view of the river. Also, I figured it might be good to take a little break from walking. So we signed up for an hour long river cruise. (In some ways traveling with a child can be a little challenging, but then there are bonuses like free admission for young children.) We didn't see any sea lions on the dock, but I did appreciate the sign. Before long we were on the Sacramento River. It was a beautiful day, and it was so nice to learn a little more about the history of the area. The city's water pumps are housed in this interesting-looking building. On the side are water depth markings. The Sacramento River fluctuates a couple feet a day at Sacramento due to the tides. The river has also been known to flood, at times quite severely. Here's a view of the Tower Bridge from the water. It sure looks bright! We didn't see any big ships on the river, but Sacramento is considered a deep water port, and the bridges open or raise in various ways to permit huge ships to pass by. After our boat ride I had one other thing I wanted to see in Old Sacramento: the Pony Express Monument. The Pony Express trail is near our area, and it was neat seeing the ending place for the mail. Someday we'll have to check out the other end! From Old Sacramento, we wandered a bit and got some ice cream, and then we headed to the State Capitol. We had explored the grounds the night before, and today we had more time to explore. Except that Desert Girl fell asleep, so I hung out in the little movie theatre for half an hour to let her get some sleep! Then we were up and walking again, checking out some sculptures. One of the ugliest fountains I have ever seen. So as we were nearing the end of our 4.5 mile walk (I didn't know it was that long till I got back and mapped it! ), we stopped to get a pedicure. It was the perfect ending for a long day. Desert Girl knows how to have a good time. She stopped and smelled the flowers all day long, and insisted that I did too. Sacramento's a great place to visit! We found that the weather was terrific in October, and we easily made our way around by walking. I was impressed with how polite traffic was--the pedestrians always had the right of way. I feel like we just scratched the surface of things to do. 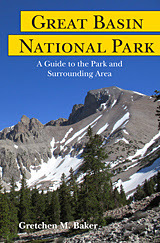 I was browsing the Internet and was delighted to find that the Kindle Edition of my book, Great Basin National Park: A Guide to the Park and Surrounding Area is now available! Also, the Nook Version is also available! Just in time for Christmas (hint, hint). If you prefer print versions, it's available from the Western National Parks Association bookstore at Great Basin National Park, the Border Inn at Baker and Economy Drug in Ely. To buy it online, try IndieBound, Utah State University Press, Barnes and Noble, Books-a-Million, or Amazon. Back in October I had some expected free time, so I decided to take a little adventure with Desert Girl. We headed to Salt Lake City and got on an Amtrak train, the California Zephyr, headed to Sacramento, California. Our goals? Enjoy the train ride and soak up some warm temperatures. The train is supposed to arrive at 11 pm in Salt Lake City, but due to the severe flooding in Colorado earlier, the trains had been rerouted across Wyoming, and when we arrived at 10 pm the train was already there and so we got to board right away. We had splurged on a sleeping compartment, as I wanted to see what they were like and I also thought it might work out really well for traveling with a child. I had been forewarned that the sleeping compartments were compact, but I still did a double take when the attendant showed us ours. Wow, very small. Like sleeping bag width. The top bunk was a little smaller than the bottom bunk and didn't have a window, so I decided I would sleep in the bottom bunk. Desert Girl quickly decided the same thing. So that meant the small lower bunk got a little squishier with both of us wedged into it. It's good we've done a lot of camping this year! Desert Girl slept fine, but the roll of the train and my excitement of traveling and wanting to see the terrain kept me from a good night's sleep. I kept peeking out the window, wondering where we were. The Great Salt Lake was a dark abyss out the window, and the Great Salt Desert was nearly the same. Then came the blazing lights as we entered Nevada at Wendover, but that wasn't a stop. Our first stop was Elko, Nevada, and it didn't feel long. I really started waking up about Winnemucca, and then we reached Reno, Nevada, for a longer stop, we got out of the train to stretch our legs. Reno got tired of trains disrupting traffic on surface streets, especially since the train tracks run right through the middle of town, so they made a "canyon." The streets cross overhead, and now cars don't have to stop for the trains. There wasn't much sightseeing in the concrete canyon, but the sewer covers are nice. We had enough time to walk all the way to the front of the train to take a photo, although Desert Girl didn't like the noisy diesel engines! Our train consisted of two diesel engines, a baggage car, a sleeping car (for Amtrak staff), three coach cars, an observation/cafe car, a dining car, and two sleeping cars. We had followed the Humboldt River across much of Nevada, but as we headed up out of Reno, we followed the Truckee River. We went to the observation car to listen from volunteers from the California State Train Museum narrate the trip. They pointed out the flumes along part of the river, used to carry water to mining areas. We stopped in Truckee briefly. On the rainy fall day, it looked pleasant enough. Then we continued on. We really liked the observation car, as we could talk to people and move around and have lots of windows. We visited with some Amish, who were traveling from New York to San Diego via train. They were getting a little train weary, but like us, kept notes as we traveled upwards into the mountains. Before long we got to Donner Lake, site of the infamous unintended camping spot of the Donner Party. The ill-prepared sojourners resorted to cannibalism to survive deep snow and cold temperatures for much of a winter. I was surprised by how big the lake is and how many homes dot the shores. Soon after we began going through a series of tunnels and snow sheds, like above. Snow sheds used to be made of wood and had rounded roofs, but the train companies found this concrete version is stronger to withstand avalanches. After a very pleasant lunch in the dining car, we went to our sleeping car room, where instead of two beds, we now had two seats facing each other. Desert Girl was getting a bit sleepy. I enjoyed the views, now much sunnier once we had crossed over into California. The massive granite made me want to go out and hike. Yellow aspens dotted the conifer-covered landscape. Desert Girl needed a break from it all and took a nap. In mid-afternoon, the skyscrapers of Sacramento came into view. We bid adieu to the train and our sleeping car attendant, which were headed to Emeryville before turning around and making the return trip to Chicago. We spent the next two nights in Sacramento with various adventures to be posted at a later date. Then, on the morning of our next-to-last day, we returned to the Sacramento train station, waited for the California Zephyr, and happily boarded. Train travel is so much easier than plane travel, and so much less stressful. Folks on board are more relaxed, there are no seat belts, and people are generally happy to share stories and just enjoy the journey. One of our favorite places was the dining car. When you buy a sleeping compartment ticket, all your meals are included. The meals are comparable to a nice restaurant. Dinner is by far the most expensive (but our compartment fee was the same in each direction, even though one included a breakfast and a lunch and the other a lunch and dinner), with entrees between $16 and $26. We sat with different people for all our meals and so much enjoyed hearing why they were on the train and talking about an assortment of subjects. A bathroom (bigger than an airplane toilet). Sleeping cars also have a shower, but we didn't bother using it as the train ride was just 13 hours. The coach car. Seats are much, much roomier than airplane seats. They have tray tables, foot rests, recline a bunch, and the best part: an outlet next to each one, so you can keep your electronics charged. Desert Girl got a lot of attention in the observation car. This really makes it a great place for parents who want to take a little break! The tables make a great place for playing cards and games and meeting other folks. The other end has chairs, some that swivel. Downstairs is the cafe car, open from about 6 am to midnight. I took well over a hundred photos of scenery, but they tend to blend together now when I look at them! I do have to say that the scenery was gorgeous crossing the Sierras. Crossing the Rockies is a very different experience. (For an account of our Salt Lake City to Denver train trip, see here and here.) Both are totally worth it. One of the things that surprised me on the trip was just how many freight trains we saw. Amtrak uses rails maintained by freight companies, so I knew we would see some freight trains. However, for crossing the Sierras, there are two tracks most of the way because there is so much traffic. It won't be long until the snow plow trains are needed! It was really relaxing watching the scenery roll by as we continued along. Desert Girl was so relaxed she fell asleep. I decided to just let her snooze on the floor. The skies were much sunnier on the downriver trip as we followed the Truckee River towards Reno. The light was fantastic as we left Reno and started heading across Nevada. The Great Basin is such a vast area, and it must have been so daunting for the first travelers across it. Every once in awhile we saw surprises in the desert, like these colorful wetlands. Evening fell and we went to the first dinner seating (there were four). Then we went to the observation car for a bit, which was not as entertaining in darkness, then to our compartment. We stepped outside at the Elko, Nevada stop, then we did our best to sleep until the train reached Salt Lake City at 3 am. It was a great trip, and I'm already looking forward to getting on a train again!